Though technically a board game—making Ouija technically a board-game movie—the Ouija board as narrative device actually offers a lot of creative leeway. Once the characters have done the necessary first-act work of conjuring some evil thing or another with the board, the filmmakers have the opportunity to take the story in any direction they want, an opportunity that is wasted here. Ouija feels like a film made under contractual obligation, which—considering it experienced a few false starts before making it to theaters in its current, significantly downsized form—could very well be the case. It’s professionally produced but completely uninspired. Everything is just so convenient in Ouija—of course the first thing Laine (Olivia Cooke) decides to take from her dead best friend’s room is a Ouija board, even though they haven’t played with it since they were kids. Of course she hasn’t forgotten any of the rules of the game or words to the invocation in that time. And of course dearly departed Debbie (Shelley Hennig) left behind hours of video of her discovering, and then playing with, the board. All these things happen because they are narratively efficient, no more, no less. The cast also isn’t doing much to sell the material. The teen protagonists are all cut from the same CW-ready cloth, alternately squinty (for the guys) and wide-eyed (for the girls). Bates Motel’s Olivia Cooke is disappointing in the lead role, delivering emotional lines like “I never got to say goodbye” in a disinterested deadpan. (She might as well end every sentence with “or whatever.”) Even the presence of veteran character actor Lin Shaye, known most recently as the medium from the Insidious movies, in a small role feels less like a loving homage à la Barbara Crampton in You’re Next and more like a happy accident. Pretty much all the scares in Ouija are of the tawdry jump-scare variety, but for what they are, they aren’t bad. The key séance scene is actually pretty spooky, and even if viewers see the kills coming a mile away (the audience at this screening certainly did), that shouldn’t dull their cheap impact. What’s more likely to lessen the effect is the movie’s PG-13 rating, which automatically precludes any moments of real terror. 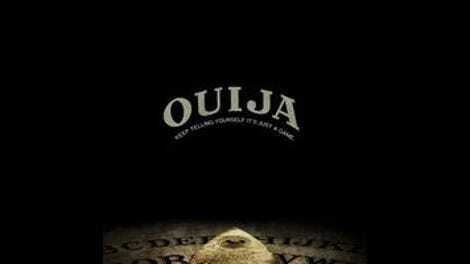 Ouija does give an unusual amount of screen time to its creature effects, a probable byproduct of director Stiles White’s background working for Stan Winston Studios. However, again, the movie wastes an opportunity by applying expert makeup skills to a clichéd spooky little dead girl, the character design of which is more than a little reminiscent of similar entities in The Conjuring. That’s not to overstate the extent to which Ouija rips off other movies, though, because that would imply the filmmakers were coming from a place of overly enthusiastic fandom. So what was the motivation for making Ouija? To serve as an ad for Ouija boards, presumably. Yet this movie is a terrible ad for Ouija boards, “based on the Hasbro game Ouija” title card and throwaway “they sell these things at toy stores” line notwithstanding. “Hey, teens,” the movie says. “You know those Ouija-board things available at a retailer near you? Play with one and all your friends will die!” Hardly the type of message to make a sane person want to run out and buy one. But Ouija isn’t a good movie for thinking, although (for those well out of the movie’s target demographic), with a few friends at a late-night screening, it’s probably a good movie for drinking.